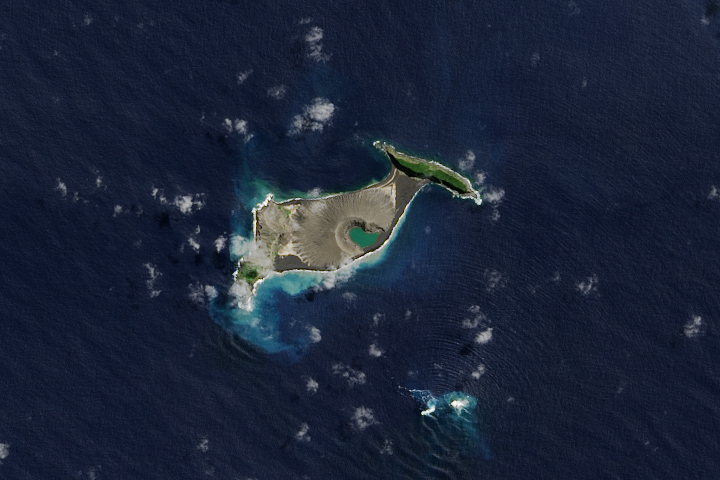 One of the Islands of the Four Mountains, Herbert is a volcanic island located in the Aleutian chain off of Alaska. 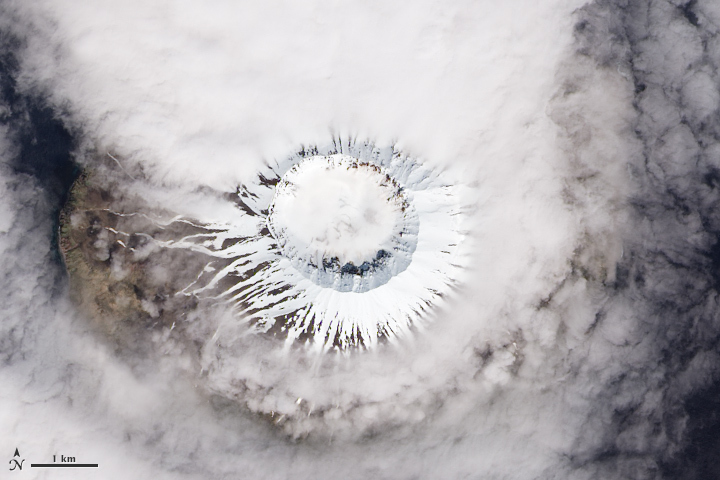 A symmetrical stratovolcano stands in its center, rising 1,280 meters (4,200 feet) above the North Pacific Ocean; the entire island is just 10 kilometers (6 miles) across. Herbert (ChiÄulax in the Aleut language) sits within a few tens of kilometers of three other volcanoes: Carlisle, Cleveland, and Tana. 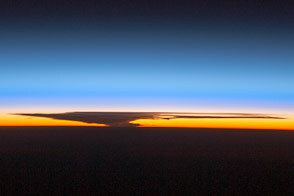 Both images above were acquired by the Operational Land Imager (OLI) on the Landsat 8 satellite. 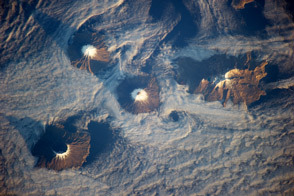 The circular formation in the center of Herbert is a 2-kilometer wide summit caldera. The straight-down (nadir) satellite view can make it difficult to determine which part of the landscape stands taller than the other, a phenomenon known as relief inversion. On June 8, 2013 (top), the summit and caldera are coated with snow and ice, while lower elevations appear to be clear. Clouds obscure most of the slopes and lowlands, with thicker cover on the north side of the island. 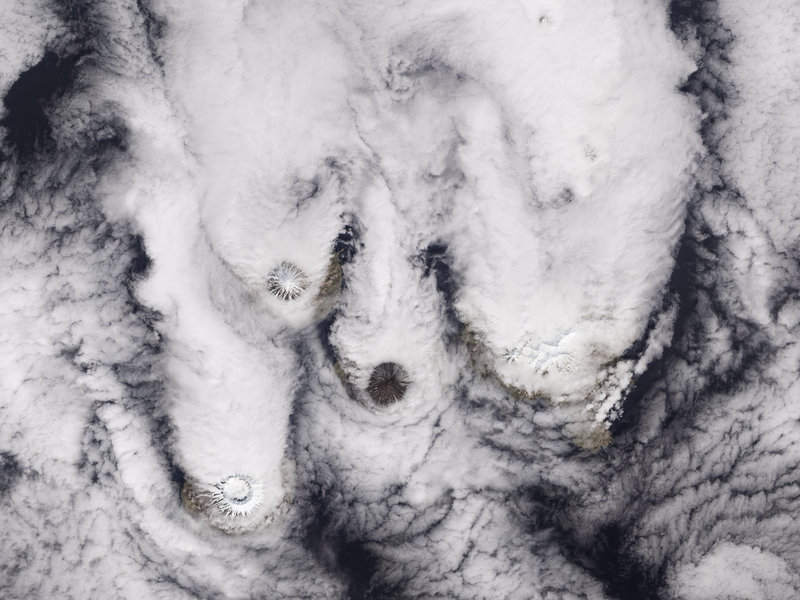 If you download the larger image, you will see that the pattern repeats at other nearby islands, suggesting that winds were out of the south and the volcanic islands were affecting the formation of clouds. 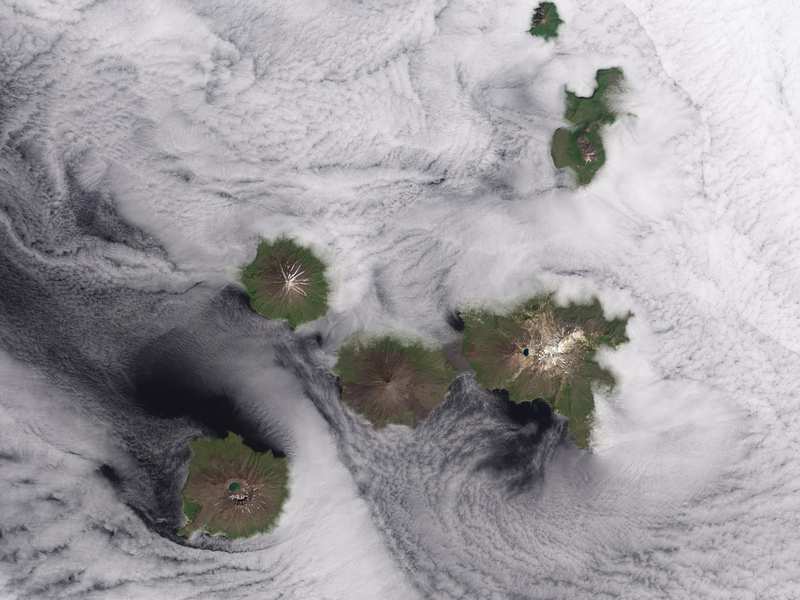 On July 29, 2014 (second image), the volcano is nearly ice free and the marine clouds are mostly offshore at midday. Alaska and its surrounding waters were unseasonably warm in 2014, perhaps leading to more melting. (See this 2007 image for a comparison of snow cover at the same time in another year.) 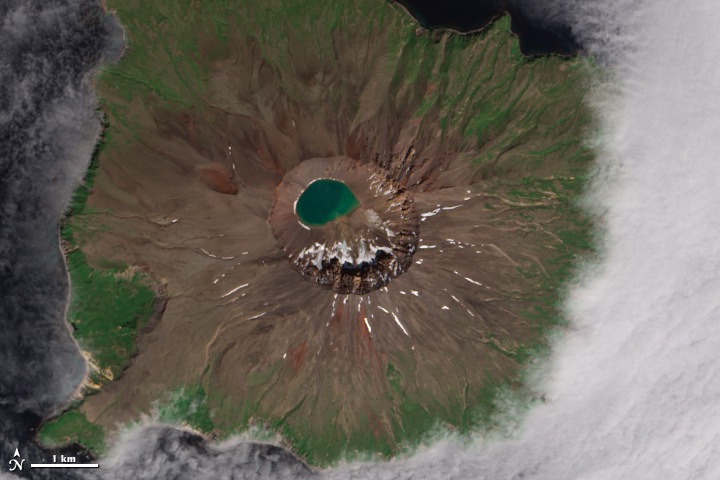 A melt lake fills roughly a third of the caldera. The remote volcanic island has scarcely been studied, and there are no records of eruptions there. Geologists have been much more interested in Cleveland volcano, which sits just 5 kilometers (3 miles) to the east on Chuginadak Island. Cleveland is one of the most active volcanoes in the Aleutians. Scientists at the Alaska Volcano Observatory keep track of all of the volcanoes in the Aleutians because ash eruptions can create hazards for airplanes that pass through the area on their way from North America to Asia and Europe. NASA Earth Observatory image by Jesse Allen, using Landsat data from the U.S. Geological Survey. Caption by Michael Carlowicz. One of Alaska’s Islands of the Four Mountains, this classic stratovolcano stands quietly next to a more active neighbor. Alaska Volcano Observatory (2014) Herbert—Introduction. Accessed November 22, 2014. Astronomy Picture of the Day (2010, June 22) Islands of Four Mountains from Above. Accessed November 22, 2014. 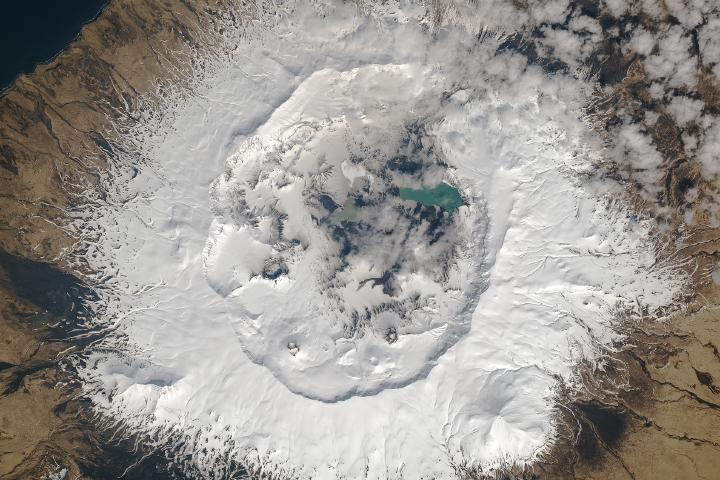 NASA Earth Observatory (2013, December 16) Islands of the Four Mountains. 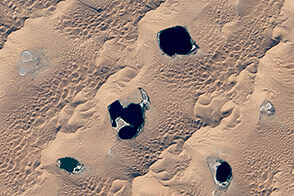 NASA Earth Observatory (2007, September 2) Islands of the Four Mountains. Smithsonian Institution Global Volcanism Program (2014) Herbert. Accessed November 22, 2014.